The Anasazi were an indigenous people who lived in the southwestern corner of Colorado thousands of years ago. The word Anasazi (pronounced ah-nah-saw-zee) is a Navajo word meaning 'ancient ones.' They were cliff dwellers who carved their intricate homes into the sandstone of the Mesa Verde area of southwestern Colorado. They were also accomplished agronomists and developed a sophisticated and extensive irrigation system for their crops which were primarily corn and beans. 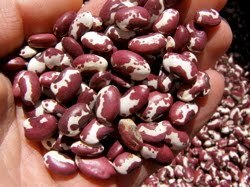 The Anasazi bean is similar in shape and size to the pinto bean, but is mottled red and white in color. The story goes that a 1500 year old sealed clay pot was discovered at an archeological dig at Mesa Verde in southwestern Colorado. The sealed pot was sent to the Colorado State University Agronomy Department for study and safekeeping. Several years later, an graduate student in Agronomy at CSU found the pot in an old cabinet, opened it, found the red and white beans inside and attempted to sprout them in the university hothouse. Much to the student and his professor's relief and surprise, several of the beans sprouted and thrived. The seeds were harvested and replanted for several years until enough seeds were stored to plant an entire field of beans. The beans were dubbed Anasazi after the people who inhabited the dwellings where the clay pot was found. Anasazi beans cook more quickly than pinto beans and have a mild sweetness to them. They are an excellent substitute for any recipe calling for pinto beans and the fact that they cook more quickly is bonus to anyone who knows how long it can take to prepare a pot of beans! Before me, Yeoldfurt had a deep-seated aversion to beans. I found that out the hard way when the very first meal I cooked for him was Sloppy Joes ...with beans. I was completely dumbfounded by his reaction when he saw the beans because I did, after all, only cook what was already in his cupboard. But after he explained his Emergency Bean policy (one can to be kept on hand ...but eaten ONLY in case of emergency ...lol), I adjusted my cooking to accommodate him. Nine years later and feeling semi-secure that he likes my cooking, I meekly suggested one day that he let me show him what GOOD BEANS could be like. He loves Cajun food, so I made him Red Beans and Rice. I made some fresh cornbread to go with it in case he was completely unable to eat the beans. But he loved it. For the past two years, he's even requested Red Beans and Rice for supper all on his own. A year or so after that, I tried another bean recipe on him (recipe here) with surprising success. So a couple of weeks ago, I decided it is now time to broaden his bean palate and introduce him to the Anasazi beans. I decided on Anasazi beans because I thought Yeoldfurt, being a Native American himself, might appreciate the historical significance of this little legume. I figured if he liked them, we would plant some in our garden for next year. Saturday morning I decided to make a small pot of Anasazi beans. It can take hours to make a pot of beans, even if you pre-soak them overnight. But that's one of my favorite things about Anasazi bean. They need to be rinsed, but don't need to be soaked which saves a lot of time. I measured one cup of beans, rinsed them, and added them to the pot with three cups of water. I brought it to a full rolling boil, then turned it down to low and put the lid on. They cooked down to the tender stage in about 30 minutes. While they were simmering, I cooked a three slices of bacon in the oven and diced up a medium yellow onion. When the bacon was done, I put the diced onion in the bacon grease and returned it to the oven for a few minutes until the onion was soft and translucent. While the onion was cooking, I ate the three slices of bacon ...breakfast. Yum! When the beans were tender, I added the onions and bacon drippings to the beans, along with salt, pepper and several dashes of Cajun Seasoning. I let them simmer another five minutes, then took them off the burner to cool. When they were still only slightly warm, I moved them to the serving dish I would use tonight and put them in the refrigerator. Thirty minutes before supper time, I warmed up the beans and made rice in the same proportions (one cup rice, three cups water). Since Yeoldfurt is as adamant about having actual meat at every supper meal as he used to be about no beans at any meal ...I also cut up a link of kielbasa to throw in with the rice and beans. I made a half recipe of cornbread and we had a cheap, easy but nutritious supper. Yeoldfurt was skeptical and I was downright nervous about that first spoonful. But he enjoyed it enough to go back for seconds so now I'm three for three on bean recipes with him. Guess it would be safe for me to start figuring out where to plant beans in our fall garden. I received this in email from a friend. Anything that can make me chuckle when I'm this tuckered out is worth sharing! My first week of overtime was not so bad. I normally leave the house at 6:00am and get home about 5:00pm, Monday through Thursday. That includes my 1-1/2 hour roundtrip commuting time. On Fridays, I leave the house at 6:00am but get off work at 1:00pm. I still get home about the same time though because I go have lunch in town with a girlfriend of mine and then grocery shop before I head home. With the first week of overtime, I worked until 6:00pm and got home around 7:00pm Monday through Thursday. I planned to work until 5:00pm Friday, but decided around 4:00pm that enough was enough. I still got in 10 hours of overtime for the week and will see that money on a separate check around mid-June. With overtime every day, we planned easy suppers and Yeoldfurt took care of the outside chores by himself most evenings. I guess I was feeling guilty for not doing my share of chores around here during the week so I got a little ambitious this morning. I started about 8:00 this morning and by noon, I had made two loaves of Chili Pepper Bread for the freezer, cooked up a batch of Anasazi beans for supper and made eight pints of plum jelly with the rest of the plums we picked at our neighbor's last weekend. I enlisted Yeoldfurt's help in pouring the jelly into the canning jars. I had to school him a little on the definition of 'finger-tight' but by the eighth jar, he was a pro. All six jars have sealed now and we'll take half of them to our good neighbor who provided the plums. When I boiled the plums for the jelly, I ended up with about a cup and a half of pulp and skins from the fruit. I don't like to see anything go to waste and the whole time I was stirring the plum juice to make the jelly, I was trying to figure out a way to use the fruit pulp. I decided to get my bread machine back out and try Plum Bread. I made my standard bread recipe, except I added the fruit pulp, substituted 1/4 cup maple syrup for the 1/4 cup oil and added a tablespoon of cinnamon. If it comes out, it would be a good for breakfast ... sliced, toasted and spread with cream cheese. Thanks to our neighbor sharing his fruit, we have about a gallon of dehydrated plums, eight pints of plum jelly and at least one loaf of sweet bread. Makes me look forward all the more to when our fruit trees really get established. I'm tired but I feel like I've accomplished a lot and I still have most of the weekend left. I hope to harvest and dehydrate the potatoes this weekend. But maybe on Monday we'll just play. It's amazing what you can accomplish in two days when you make a list and stay focused. Aside from our usual weekend errands and chores, we moved out a new round bale for the horses, made a batch of liquid laundry soap (3 month's worth), picked, cleaned and dehydrated three trays of plums (courtesy of our neighbor who has free access to our figs), planted a bed of Swiss Chard and harvested another batch of green beans from the garden. I even had time for a short ride in the front paddock this evening. It feels good to come to the end of the weekend and see that much was accomplished. I start 10 weeks of overtime at my job next week, so most of what gets accomplished around here will likely be done by Yeoldfurt. I'll be working 10 to 11 hour days and factoring in 1-1/2 hours of drive time each day, I won't be up to much more than making dinner and cleaning up the kitchen when I get home. But the extra money will be nice and it's only 10 weeks. I can do anything for 10 weeks. The first batch lasted over three months and the cost per load was mere pennies. Even the first time we made it, we found it to be surprisingly less complicated and time consuming than we expected. But I think we've improved on the process with this second batch. The most time consuming aspect is grating the 1/3 bar of Zote. Yeoldfurt being the meticulous and conscientious fellow that he is, used the side with the smallest holes on my grater to achieve the finest shavings possible so that it would melt quicker and more consistently. What a guy! Last time, we used water straight from the tap to pre-measure the 1 gallon plus 6 cups of water needed at the end of the recipe into our mixing jug. Coming straight from the tap, the water in the jug was downright cold in comparison to the hot melted soap water we poured into it. As a result, it gelled almost instantly and required a lot of shaking to homogenize the two liquids. So this time we heated the 1 gallon plus 6 cups in a separate pot on the stove. We got it hot, but not boiling and poured it into the mixing jug just before we started cooking the soap. Another thing we changed was to eliminate the use of the 2-gallon bucket in the process. Last time, we melted the grated Zote, added the powders and then poured that mixture into a 2-gallon bucket where we added the 4 cups of hot water we had heated in the microwave. When it was well mixed, we used the 2-gallon bucket to pour the soap mixture into the jug. Realizing that the pot we were boiling the soap mixture in was plenty big enough to hold the extra 4 cups of water from the microwave, we just eliminated the 2-gallon bucket from the process. Grating the soap probably took 15 minutes all by itself, but the rest of the process, including transferring the finished product into our laundry jugs and wiping down the counters, only took an additional 15 minutes. So start to finish, it only took us 30 minutes to make 3 months worth of laundry soap. It would take me longer than 30 minutes to drive to town and buy the same quantity and I would spend at least ten times as much on the purchase plus my gasoline. We saved time and money, it was a win-win. How Did Your Great Grandmother Do It? As Yeoldfurt mentioned in his post today, we got a bunch of plums from our neighbor on a barter deal for our figs. Now I have about 12 pounds of ripe plums needing me to do something with them. Jelly was the first option that came to mind, but I haven't made jelly in several decades and I don't have any pectin in the cupboard. I told Yeoldfurt I would pick some up at the store and he said, "What did your great grandmother do ...surely she didn't run to the store and buy pectin." Well, he's right. Everyone's first instinct (including mine) is to run to the store and pick up what we need. But that's not always practical and in a shtf situation, may not even be an option. So I decided to do some research. I knew pectin was a naturally occurring substance and I was pretty sure it was derived from fruit. But that was the extend of my knowledge on the subject. Turns out I was right. Pectin is the chemical component in fruit that makes it firm and hold it's shape. As fruit ripens and eventually over-ripens, the pectin breaks down and the fruit becomes soft and eventually shrivels up. Maybe it would be more accurate to say that as the pectin degrades, the fruit softens and eventually shrivels up...kind of a chicken-or-the-egg conundrum. Pectin degrades quickly, even commercially produced pectin doesn't have a long shelf life. So it is not something you want to keep in the cupboard from year to year. The process to make your own pectin is not terribly difficult or time consuming but it does pretty much double the amount of time it takes to make jelly. So while I think it is good to know how to make your own, I told Yeoldfurt that unless and until we are in a shtf situation, I would prefer to use store-bought. He laughed and said okay. Here's what I learned about pectin. It's is a naturally occurring polyscaccaride found in berries, apples and other fruit. When pectin is combined with sugar and subjected to prolonged heat, it causes the thickened gel-like consistency we expect in jams and jellies. Without a source for commercial pectin, our great grandmothers stood over a big pot of boiling fruit jam, stirring and getting splattered by hot jam until it finally cooked down to a thicker consistency. The prolonged boiling also broke down a lot of the vitamins in the fruit so it was not an ideal way to make jelly. If your great grandmother was very knowledgeable, she made her own pectin. She extracted concentrated pectin from apples to speed up the thickening process and allow her to use less sugar. 3 pounds sliced, washed tart, green apples (like Granny Smith) with peels and cores. Crabapples are the best. Small, green, immature apples of most varieties work, too. Wash, but don't peel, about seven large tart green apples. Put them in a pot. Cut them into pieces, add 4 cups water and 2 Tbsps lemon juice. Boil the mixture approximately 30 to 45 minutes, until it reduces by about half. Boil the juice for another 20 minutes. Pour it into sterilized jars, and seal them. Jars can be stored in the refrigerator for several weeks, the freezer several months, or processed in a water bath canner to be stored in the cupboard for up to six months. As I said the processing time to make your own pectin is about the same as the processing time to make your own jelly. Considering your have to buy (or obtain) fresh fruit to make your pectin, I'm not sure you are saving any money over the store-bought pectin. But it's good to know how to make your own if store-bought is ever not an option. We will be going into town later, checking out another antique store in Yeoldfurt's quest for a scythe and we'll be stopping at the local grocery to pick up some pectin so I can make jelly from all these plums. It was a lazy weekday evening in a normally quiet semi-rural neighborhood. Most of the homes sat on 1-5 acre wooded tracts ...large enough and wooded enough that you could have a bunch of rowdy kids or a loud conversation between adults in your own backyard without disturbing any neighbors. But this particular evening, there was some excitement back in the woods. A woman shrieked and a male voice could be heard yelling, "Hold her!!" and "Hit her again!!" The woman shrieked again and the sound of something or someone big crashing through the dense woods could be heard for quite a distance. Two deeply male voices erupted into laughter. Then all was quiet again. A few minutes later, three riders emerged from the woods. Two men and a woman on horseback. The woman was quiet, feeling sheepish for having shrieked not once, but twice ...and the men were laughing about how it must have sounded to any who could hear but not see what was going on. You see it was me and Yeoldfurt and my son who was staying with us at the time. We had ridden our horses back into the woods at the back of our property and my mare decided something big and bad was hiding in the back corner. She must have been SURE there was a bear back there by the way she was acting. She was fairly young at the time, barely 100 rides on her so far and young horses can react in a big way when they feel threatened. When she first started getting nervous, she just danced a little and refused to step closer to the big scary corner post. When I insisted, she finally snorted and spun 180 degrees with every intention of leaving that horse-eating corner post far behind her. That was when I shrieked the first time. I'm not proud of the fact that such a definitively girly sound of panic erupted from me without warning, but it did. It must have surprised my mare too because she froze. I smacked her with the flat of my hand on her neck, making a loud THWACK sound that startled even me. For any PETA people reading this, trust me, you can NOT hurt a horse with the flat of your hand ...you will break your hand before you do any damage to the horse. I slapped her and said, "WHOA!" as forcefully as I could muster. I may have even said "WHOA-DAMMIT!!" ...I'm not sure but it wouldn't surprise me if I had. My horse, of course, was already stopped which is what 'whoa' means so when I slapped her, she went back into action and did a little cutting horse dance, snorting and spinning this way and that way, apparently looking for the most viable escape route lest that corner post try to eat her. That's when Yeoldfurt yelled, "Hold her!" and "Hit her again!" My son was quiet through most of this but when things calmed down, he said to Yeoldfurt and me, "You know how this sounded, don't you?" Two obviously male voices yelling "Hold her!" and "Hit her again!" and a woman shrieking, not once but twice. We all had a good laugh and started back out of the woods toward the barn. Laughter is one of the best calming agents for a nervous horse, so the rest of the ride was almost boring by comparison. I am happy to say that both my mare and I have come a long way since that day in the woods. She is now ten years old and had many many rides in all kinds of different situations. A trail ride we were supposed to go on yesterday was cancelled due to too much rain the night before. But Yeoldfurt got up this morning and suggested we go have our own trail ride at the Lake Somerville Equestrian Trails. It was hot today and Yeoldfurt has a low tolerance for heat, but he was determined. We took our time, loaded the trailer with what we needed, loaded the horses and headed out. It's only a 30 minute haul to the trail head and we had the place pretty much to ourselves when we got there. It was just after 12:00 noon so campers who had been there all weekend had already headed home or were preparing to do so. We rode around the campsites for a while and then headed down the trail. Lake Somerville has 23 miles of trails. They call them Equestrian Trails but the horses have to share them with bicyclists, hikers, joggers and even the occasional baby stroller and yapping dog on a leash. The trails are densely wooded on either side, so there are plenty of deer, rabbit and squirrel to keep things livened up along the way too. Today's ride was short, but very enjoyable. Yeoldfurt's mare is really low mileage so she can still be unsure of herself in new places. She's also half-Mustang and, therefore, VERY opinionated so she can be downright argumentative at times. But today, both horses were as good as gold. There were only one or two incidents when something in the underbrush made one or the other of them nervous, but all they did was stop hard and stare for a minute or two, like "What was THAT!?!" Then they'd just sigh and move on down the trail. I am happy to say that I did not shriek once today. In fact, I don't believe I have shrieked in several years ...at least not because of any antics my horse pulled while I was on her. Yessiree, we've come a long way, my mare and me. Sometimes no matter what you do, you can't win. Someone else has all the power and you're quite simply at their mercy. It can destroy your mood for a while, or even the whole day. It can destroy your joy for life if you let it go that far. At the time, it seems like the challenge ...the hardship ...is in what the other party does or says to tear you down. But the real struggle is not allowing yourself to become like them. Hateful, vengeful, vindictive. You can't control what others choose to do with whatever power they have, but you can control how you react. My mother used to say it doesn't matter what other people do to you, YOU do the right thing. She was right. We are accountable to ourselves and to God. Period. How many times when we disciplined our children were we swayed by the excuse 'but they did it first!' I doubt the Lord would accept such an excuse either. So whatever the circumstances in your life, whatever others do to you or say about you ...YOU do what you know is right. And if ever you find yourself with such power over someone else, however justified you may feel in devastating their life in a big way or even a small way, please please err on the side of compassion. Lest any who read this think I'm talking about Yeoldfurt, I am most certainly not. He is my best friend, my shelter in the storm ...this one and all the others.